Well, first of all, Santa Barbara never had that colorful era where huge canneries sucked zillions of sardines from the sea and packed them off. Now the sardines are long gone and so are the canneries, replaced by hotels and seafood restaurants. This is John Steinbeck Country. His colorful lore is as much a part of the ambiance as bowls of warm calamari and old-timers’ stories at the Sardine Factory bar. 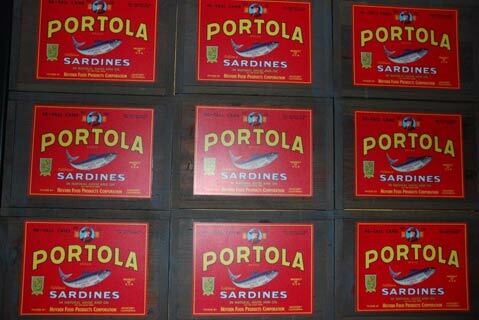 His 1945 novel Cannery Row was a hit just as the sardines were starting to run out. Nor does Santa Barbara have sea otters lolling around in the water in easy view of hotel guests and tourists gobbling crab, salmon, and, of course, shrimp. Monterey still lives off the sea. Both towns sport tourist-magnet wharfs. Santa Barbara’s Stearns Wharf is more of an excursion onto a wide-open pier with a few eateries, while Monterey’s Fisherman’s Wharf is wall-to-wall with restaurants equipped with large windows offering views of Monterey Bay and the marina, the better to please tourists as they knock back drinks and dig into plates of good old seafood. Once it was a cannery. 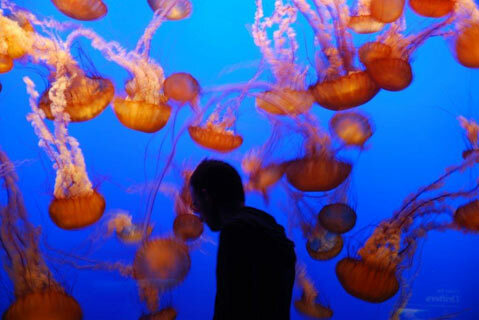 Both cities relish their relationships with the sea, but Monterey took a giant step with its prime attraction: the Monterey Bay Aquarium, located in the old Hovden Cannery. Sue and I strolled the place for hours, drawn to the surrealistically beautiful jellyfish and the popular seahorse exhibit. 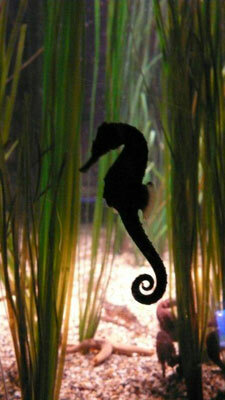 Yes, seahorses, tiny, delicate fellows bobbling about behind glass. Kids knelt in wonder. Alas, the Aquarium’s star, a great white shark, was gone, evicted after a too-close encounter with a huge tuna in the giant tank. There wasn’t much left of the tuna, from what I heard. I recall someone wanting to build an aquarium near our East Beach some years ago but the plan soon sank. Let’s see, more comparisons. Santa Barbara boasts its millionaires’ haven, Montecito, while Monterey has its low profile, high-end Carmel, a few minutes away. 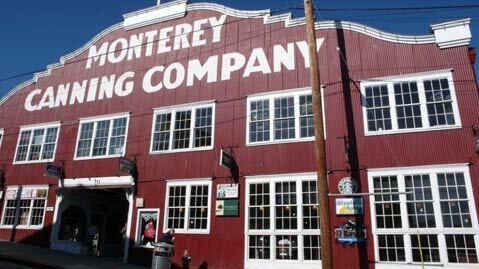 It’s the cute, ultra-neat sister of Monterey’s brawny, blue-collar cannery worker who learned to cook and opened a restaurant. Sardine exhibit at the Aquarium. Carmel is loaded with world-class restaurants like Casanova. Santa Maria-born Vanessa Bogenholm showed us around the place, which looks like it was designed by a happy European poet in love with colors. We followed Vanessa down to the wine cellar, where 30,000 bottles awaited diners. Most expensive one: a $13,000 burgundy. We passed. Carmel is also Doris Day country. The inviting, stylish bar at her Moorish-style Cypress Inn is a locals’ hangout. Dogs are welcome too. Eat Here Now: We dropped our bags in the excellent Monterey Bay Inn, where the bay churned below us, otters made repeated dives for shellfish, gulls flashed by the window, and pelicans patrolled. Cookies at the front desk and complimentary breakfast delivered to your room. Binoculars on the shelf. Aquarium visitor at jellyfish tank. A short walk to the left took us to Fisherman’s Wharf, where everyone goes to casual Abalonetti’s for tasty local calamari washed down with local beer. For a white tablecloth meal, though, head for John Pisto’s Domenico’s on the Wharf, specializing in steak and lobster. Turn right from the hotel and you’re heading along Cannery Row, with the Aquarium a few blocks ahead. Along the way we found the Fish Hopper, a great place for a snack on the deck while gazing down upon the otters. The sunset view is legendary. Halfway down the street there’s wine tasting at the Scheid Cannery Row Wine Lounge, where they pour the juice from the company’s huge holdings. Having passed on the $13,000 burgundy, we bought an Odd Lot Red at a Traders Joe’s price. Sea horse at the Aquarium. At cocktail time, the tradition is to go one street up to the Sardine Factory restaurant on Wave Street for a martini. Which we did. In the old days it was a cannery workers’ canteen. Partners Bert Cutino and Ted Balestreri struggled to open it on a shoestring in 1968 and now own a massive amount of Cannery Row real estate. Carmel’s excellent restaurants include Cantinetta Luca, on Dolores Street, between Ocean and Seventh, and Pacific’s Edge knockout views in the Highlands Inn Hyatt, south of town on Highway 1. One sunny afternoon we headed out of town on bucolic Carmel Valley Road to the famed Bernardus Lodge and Winery. There, celebs find peace, quiet, fine food, and an impressive wine list. We found lunch: platters of shrimp, oysters, roast beef, scalloped potatoes, plump asparagus, and roast chicken. 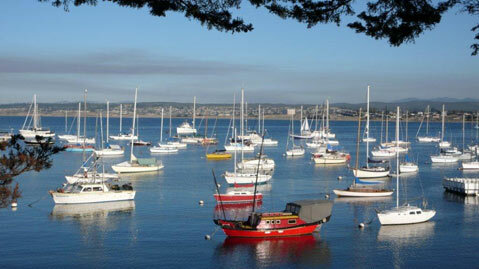 Monterey-Carmel is about a five-hour drive from Santa Barbara.